This time of year everyone talks about being grateful and says "thanks" to those who've made an impact on your life or your business. 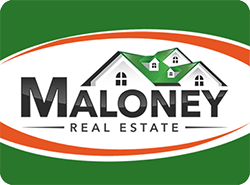 This year that is especially important for us at Maloney Real Estate because it marks our 5th anniversary of being in business. Five years ago, on what would prove to be the coldest night with a surprise winter storm, we held our Open House and Ribbon Cutting, and wouldn't you know it...over a HUNDRED people showed up. We were very encouraged by the support but had no idea how much the community would embrace us, and boy, did they! Every year we've grown not only by the amount of clients we have, but by the number of agents. Starting with just two of us, we quickly grew to three and now we have five agents, with two more coming on board in 2019. To say we are blessed is an understatement. We've chosen this important anniversary to reflect and make improvements to our office and to our processes so we can serve our clients and our community even BETTER. Stay tuned for those changes! We hope you have a wonderful holiday, and please know how much we appreciate your trust, your support and your business. Happy Fall, Y'all! Hard to believe summer is over, but there's something about the crisp morning air, jeans and sweatshirts, and football games that makes it all worth it. Fall is a great time to take a look at how your biggest investment, your home, is doing in the marketplace. You may be surprised at how much it's appreciated since you bought it! If you think you need more room or you're ready to downsize, we can tell you how much your home is worth and what larger or smaller homes will cost for your next step. Click on our Property Valuation tab and we can help you get started on your next step. Mark the day - August 19th, 2016. We entered the blogoshpere. I hope to find topics you'll find helpful and interesting, and not musings on what I ate for breakfast, or how the Cubs are doing (great, by the way). We have a new website that I think will help you find what you're looking for!